Here are 4 free Windows 8 News apps available under the ‘News & Weather’ category of Windows 8 Store. All these News apps for Windows 8 keep you abreast with all the latest updates on different topics, right on your Windows 8 system. Also, you can view News videos in case you are not feeling like reading the entire content thoroughly. Newsy is one of the most popular News apps found in Windows 8 store at zero cost. Its, basically a video news app that keeps you updated with all the latest stories happening around the world categorized into various sections such as Business, Politics, Technology, Science & Health, Sports, and more. You can also watch breaking news videos specifically about U.S. Yup.. Newsy comes up with a separate column as ‘Breaking U.S’ where you can get all the latest updates and happenings around the country. As you click on a news, it will quickly bring you a video along with the sources. There is also an option to transcript the currently playing video. This makes it easier for you to under what exactly is the news reader speaking. You can also share news videos with others via Windows 8’s Share Charm. Read more about Newsy or just head over to the Windows 8 Store and download Newsy now. 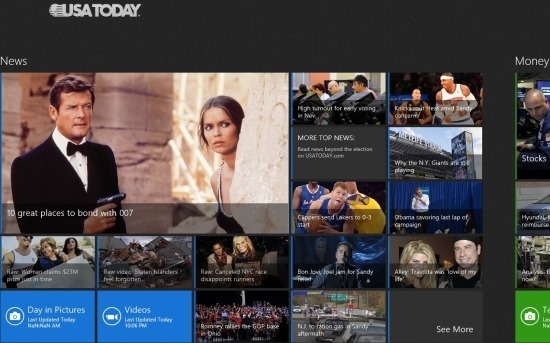 USA Today is another popular Windows 8 News app that can be installed from the Store at no cost. You can get all the possible info on happenings of USA. From Justin Timberlake, to Harry Clinton, to Obama, you can get all the hot affairs, world agendas, USA’s local News, just everything on your Windows 8 system. There are six different categories in which News have been divided such as News, Money, Sports, Life, Tech, and Travel. In addition, you can also track updated weather of all the cities in the USA. This News app for Windows 8 lets you select a city and track its weather conditions. The interesting part is that you can view photos of related category, watch related videos, and share stories via Windows 8’s Share Charm. Read more about USA Today or simply download it from the store. Yet another Windows 8 News app that brings you all top stories and the latest news along with Live Sky News TV. No matter what you are working on, Sky News wont let you miss even a single important breaking news. You can switch on to Live Sky News TV, whenever you want. Updated video bulletins and headlines, you can get it right on your Windows 8 system. The good part is that you can also search for a particular type of story and share articles via Windows 8’s Search Charm with others. Read more about Sky News or just install it from the Windows 8 store now. Ending my post with this last but not the least Windows 8 News app, Sify News. This app connects you to the entire world by bringing you all the latest updates and top stories covering the entire world. This News app keeps you abreast with all the current stories from your local areas and the entire globe. Categories such as Sports, Finance, Movies, Techtalk, and more are included to choose reading News from. You can also share articles with your friends or family via Share charm. Get more info about Sify News or simply download it from the Windows 8 Store.